How To Clean Your Roller Derby Pads on Jezebel. I'm just here to say that my stuff was bad, and what she said worked. I do bring my gear home from every practice, but I'd been getting lax about actually unpacking my bag and letting my gear air out. That's really the first line of defense for staying at Stage 1, I'm back to that again. I haven't tried the thing with the vodka. Unpack and air gear after every practice! Put 1/2 cup white vinegar and 1/4 cup laundry detergent in a bucket or the tub, I used my five-gallon Home Depot bucket but maybe the tub is better. Fill with very hot water. Add gear, hold it down to saturate and then swish around for a few minutes. Then actually I let it soak overnight. Tack down all velcro to itself. Use whatever combo of gentlest cycle and hottest water is available at the laundromat. 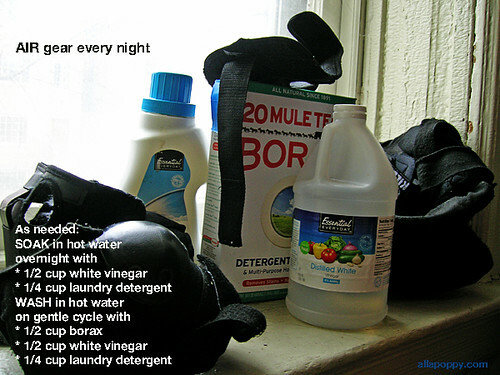 Add 1/2 cup Borax, 1/2 cup white vinegar, and 1/4 cup laundry detergent, then gear. Remove gear after spin cycle and hang back at home to air dry. And, it worked. So I think this is going to be my way, let things air out every night and then soak followed by wash say every other month.